As a field service management company, you need to successfully manage your team to experience the greatest profits. With the right field service software, you can get an all-in-one solution that makes the task easier, streamlines your operation and improves customer service. Dataforma offers a more effective way to streamline your field service operation — and we do it by customizing our software to meet the unique needs of your specific industry. Read on to learn more about how the best field service management software can improve your bottom line. Field service software is no longer behind the scenes. Some businesses, like Uber, use their field service management software as one of their main selling points. In fact, half of all businesses that implement a field service program use it for customer alerts. Businesses depend on the best field service management software to improve productivity. In fact, 97 percent of field service management software users said that the software had made an impact on how their business operated. Companies said that the number of jobs they could finish in a day increased by 47 percent. Field Service Management (FSM) programs have many benefits for construction companies. It can help you schedule more jobs and complete repairs more efficiently. Scheduling issues are one of the biggest problems for both technicians and dispatchers. FSM software offers real-time scheduling, which alerts technicians immediately when a new job is scheduled. Most FSM software also lets you optimize appointment bookings. With this feature, you’ll be able to plan the best route between jobs. If you use Windows to schedule appointments, appointment optimization can help your technicians determine the most efficient order for completing jobs. A mismatch between the job’s requirements and a technician’s skill is a problem for both the company and the tech. In fact, it’s one of the biggest concerns that field technicians raise. Field service software often includes a skill management feature. You’ll be able to input your technicians’ skills and make notes about their training. When you schedule a job, you can look at skill sets to make sure that the tech you’re scheduling has the right training. Lack of information is one of the biggest obstacles for construction, HVAC, and other field service management businesses. With field service management software, you can keep this information in a centralized location. Technicians can use their app to see job history and related tasks. They can also upload photos or documents while they’re working and use the software to view schematics and real-time parts inventory. Both technicians and managers can benefit from easier time keeping. Too often, technicians need to enter hours worked at the end of a day or other period. With FSM software, technicians can quickly update their timesheets while on the job. You’ll have a better breakdown of how much time techs spend on each job, and finishing payroll with be faster. Many field management programs allow businesses to create task breakdowns for different types of jobs. Although this will take more work upfront, it’s well worth the time invested. Detailed task breakdowns help technicians stay on time. It also helps them ensure that all of the tasks needed for a repair have been made. Both of these can improve customer satisfaction and lower the chance that you’ll need multiple appointments to complete a repair. ing needs and keep track of an employee’s contributions to the company. Many field service programs include customer alerts, a consumer portal or mobile apps for customers. All of these features can help you provide better customer service. Many small businesses consider service alerts a valuable feature in their field service software. In fact, about half of all businesses use this function to notify customers of changes in their job. 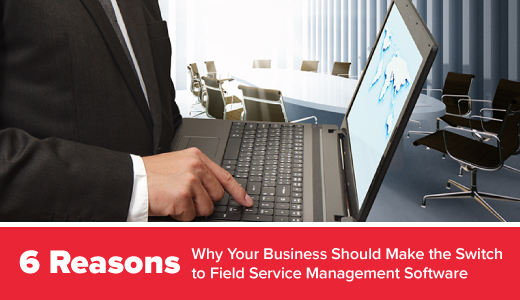 Are There Downsides to Not Switching to Field Service Management Software? Even with these benefits, it’s common for business owners to wonder if they really need to switch to FSM software. Although your business can survive without it, the benefits of switching clearly outweigh the costs. If you’ve been dealing with scheduling issues for a while, you may be used to them. By allowing them to continue, however, you’ll miss out on the increased productivity and revenues that a field service app can help you achieve. Businesses that aren’t using field service software can miss out on these benefits. These businesses will need to spend more time and money to achieve the same results that companies using FMS experience. For other businesses, FSM software does more than free up time and money — it can help you reverse negative trends. 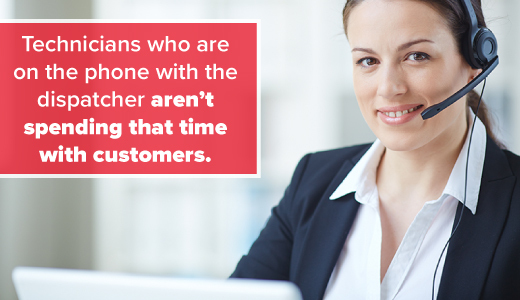 Have customers started to complain about a lack of communication or late technicians? Field service software for small businesses can help you provide better customer service. Many companies start out using Excel or a simple database to track their jobs. This is particularly common in small companies. If you have just a few field technicians, justifying field service software can be hard. 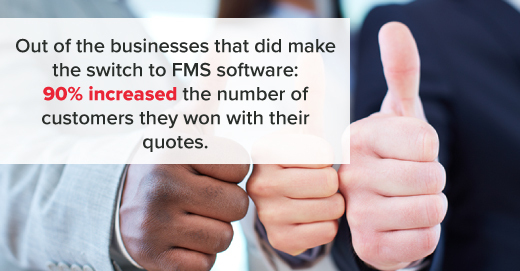 However, many companies see improvements when they switch to an FSM. In fact, small businesses can experience some of the biggest benefits of switching. Many of these errors are the result of transcription difficulties. Because there’s a gap between jobs being completed and notes being entered, it’s common for techs to struggle to “fill in the blanks.” If paper receipts have been lost or damaged, it’s even harder to get an accurate account of a job. Cloud-based FSM software lets techs enter notes and track time while they’re on the job. That means there’s no need to decipher bad handwriting. There’s also no concerns about forgetting an important part of a morning job when they enter details at the end of the day. 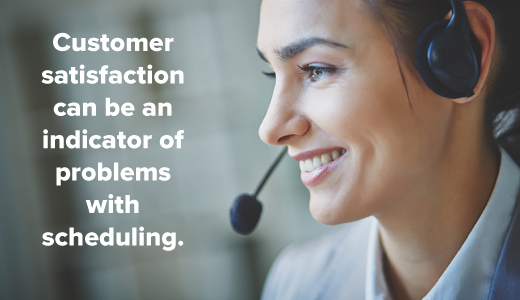 Customer satisfaction can be an indicator of problems with scheduling. This is particularly true if customer satisfaction is dropping at the same time your company is growing. Many of these issues are the result of poor scheduling and job management. Poor scheduling means that technicians show up late to jobs, are rushed on the job site and are left with too much idle time between jobs. Electronic scheduling and GPS tracking help fix these issues. In addition, many companies use the program to send alerts about the job to the customer. Customers who know when their technician will arrive are happier. It’s inevitable for some repairs to require multiple visits. When two or three visits for a simple repair becomes the norm, it’s time to consider using software to simplify repairs. There are several potential causes for this problem. Do your technicians need additional information about customer history to complete the job? Without electronic access, techs may need to go to the office to get this information. This can slow down repairs significantly. Do technicians require multiple visits because they don’t have the parts needed to make a repair? Trouble locating parts is often the result of poor recordkeeping. If your technicians can access an inventory of parts and their location in the field, they’ll be able to complete jobs faster. Diagnostic trouble can also cause repairs to take longer. If your technicians need to reschedule jobs because they don’t have the right diagnostic equipment, it’s time to consider field service software. Some of this software has diagnostic tools built in. Others include a history of previous diagnostic reports in the client notes. Both can speed up the time needed to complete a fix. Visibility is one of the biggest problems for growing companies. If you don’t know where your technicians are or what jobs they’re working on, it may be time to upgrade your technology. Many companies struggle with scheduling challenges as they grow. Calling your technicians isn’t always the right answer, either. Technicians who are on the phone with the dispatcher aren’t spending that time with customers. Many field service software programs solve this by offering electronic scheduling. You’ll be able to schedule a technician’s next job on a map, and electronically alert him of the location. Because many of these programs have GPS built in, techs can alert you or a client if they’re running late. How Long Does It Take to Learn How to Use an FSM Program? Time is one of the biggest obstacles for many small businesses. Selecting and learning to use a field service manager doesn’t take long, though. A survey of businesses that use field service software showed that most businesses needed just a few weeks to select the right field service software. Most companies are up and running on their new software in under six weeks. Nearly three-quarters of all companies that started using an FSM had it installed and completed training on it within two to six weeks. Ease of use is critical, especially if you’re new to using field service software. So, it’s no surprise that 74 percent of companies cited ease of use as the number one reason they selected their field management program. Expect a learning curve when you begin using field management software, but it should be short-lived. Within a month, most companies find that the increased functionality — and improved productivity — makes this learning curve worthwhile. Many factors affect your choice of field service software. These include how the software functions, how much it costs, and who will use it. Even your comfort level with new technology can play a role in your choice. What Types of Functionality Do I Need? The first — and most important — question for most businesses is what your field management software should do. Most field management software will allow you to schedule technicians electronically and access customer records on the job site. In addition, many businesses want their field manager to integrate with other types of software. For instance, some businesses may want to connect their technician’s time tracking directly with their accounting software. Not all programs have all of these features. The best programs can be customized to meet your business’s needs. If you’re not sure whether a particular program is right for you, ask the provider whether it can be customized. Once you’ve developed a list of what your software needs to be able to do, you’ll be better equipped to find the right field service program for your business. How Will I Host My Field Service Management Software? Most field service programs are easy to use. That means that one of the biggest challenges most companies face is deciding how they’d like to deploy the FMS system. The first option is to host your FSM on site. Hosted software is usually installed on a server in your offices. You’ll often purchase hosted software outright. Hosting your FSM may offer you more security and peace of mind. If a business is hosting their own software, they’re usually also able to make more changes and customization to the program. However, you’ll be responsible for maintaining the system and upgrading it if needed. If you’re not tech-savvy, you’ll need to hire someone to maintain it for you. The second option is to subscribe to a cloud-based FSM system. Cloud-based software is usually hosted by the company providing it. Unlike hosted FSM systems, you won’t be responsible for maintenance or upgrades. The software company will take care of these for you. The hosting company also takes care of information security and data backups. You’ll pay a subscription fee to use the software, usually monthly. You’ll frequently see cloud-based FSM software referred to as a SaaS, or software as a subscription. From a technician’s point of view, there are few differences between hosted and cloud-based FSM programs. Both can be accessed via a webpage or mobile app. How Will You Access Your Software? To select the right program, you’ll need to know who will be accessing your field manager and how they want to access it. Most field service programs are accessed via a web-based application. This application usually provides the widest range of features. You’ll do most of your initial setup from the site, including inputting tasks associated with different types of jobs. If your technicians primarily work on their Internet-connected phones or tablets, a web-based application might be the best choice. It’s a good idea to make sure that the software you’re considering has a mobile app for technicians. Mobile apps may not have the full suite of tools that are available on desktop, but they make up for this by providing a good user interface that puts the most important tools at your technicians’ fingertips. 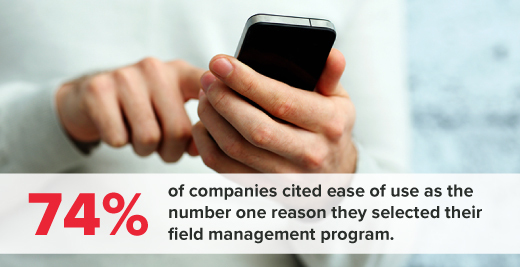 Having access to a mobile app for your field service software may be a deciding factor. For instance, we recommend that all of our customers at roofing, electrical, and HVAC businesses use a mobile app. That’s because it’s easy to take with you while you’re on the job, and you’ll be able to quickly note safety issues or review schematics. You may also want to consider a customer portal or customer app. A customer portal can make a big difference in their experience with your company. Your customers will be able to use it contact you for support, check on the progress of your job or pay bills online. Find out more about our field service webpages and mobile apps. In the past, many companies hosted their field service management software themselves. Businesses thought that outright purchase meant that the cost of owning and running the software was lower. They were also able to customize the software more. This is no longer the case. Many cloud-based systems are customized to meet a business’s needs. Some on-site software programs are switching to annual or quarterly licenses instead of a one-time purchase. You can use an online calculator to compare the total cost of hosting your own program versus subscribing to one. You may also want to consider information security when deciding whether to self-host or subscribe to a cloud-based field service program. Field service programs are often full of valuable information. GPS data, customer contact information and billing information can all be contained in it. Many small businesses choose to subscribe to a cloud-based FSM program because of the added security it offers. With an on-site FSM, you’ll be responsible for backing up and protecting information. Subscription FSM programs may offer you more security. For instance, Dataforma offers data encryption, backups, and security fail-safes with our program for field service management companies. We even protect our data against natural disasters. This can give you added peace of mind that your information is protected and available when you need it. Find out more about what our field service software can do for your business! We should have more content out soon – check back with us!